Register Log In GliderCENTRAL Forums Bonding & Relations Yikes! Out of cage safely? Hi all. I need help. Important info: First time suggie mom, two girls, Thelma and Louise, 5 months OOP. I've been very slowly going through the bonding process doing all the regular things (bonding pouch, tent time, opening the cage and giving treats, hanging out, etc). I admit I've wondered if they were ever gonna let me touch them without crabbing or bolting. Even during tent time, they only hang out on me if I'm as still as a statue and make no sudden movements. Last night, however, I was the one who freaked lol. We're going through our normal routine and Thelma flew straight through the open door and latched onto my shirt. While I was recovering from that shocker lol, I look up to find Louise hanging on the open cage door. My first thought was "HOLY CRAP!" and my second was "oh crap what if they get loose and won't come back?!" What am I supposed to do now exactly? This is obviously what I've been waiting for and I'm incredibly excited that they're considering adding me to their colony. BUT, when do I know it's ok to walk around my house with them on me? How do I not lose them if they're still unsure about me? They'll let me pet them gently but so far holding either of them is a no-go. This is a great problem to have but I'm just not sure how to approach this next phase. If you can make the room with their cage in it glider safe do that just in case. Try to secure the room as well by closing the doors, making sure there are no open windows, etc. If they want to hang out on your shirt let them. They may want to explore too. One of my boys (Elric) loves crawling under my shirt and exploring. He once scared Arwen doing that when she saw a bulge in the shirt coming right at her. If you have a treat they can eat in small doses that can be good to keep them near you. I like using unsweetened apple sauce. Dipping my finger in it and holding it out to them gets them complacent. 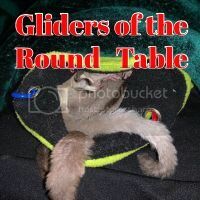 Getting gliders back in the cage after play can be an ordeal. I have four (and the same cage you do) and when I let them out to play in the room (I use red lights so they are more active and I can see them) I just lay there with my tablet reading or whatever and let them run around and play with them when they come to me. Try not to chase them to get them back. I usually get them back in by letting them climb on me and when they are running down my arm put it back in the cage and they often jump in. One of my girls (Eilonwy) is particularly hard to get in. I usually wait until she goes to hang out in the closet (often with her sister). Then I turn the closet light on. Then they want cover so I hold out a pouch and they usually dive right in and then I put it on the cage floor and turn the light off and they pop right out. The hard part is that while I am putting one or two of them into the cage the others already in the cage are often trying to escape and and are sneaky and often succeed so getting them in is an exercise in patience and learning to distract them. Sometimes they will get out. I came home late one night and finding Arwen sitting on the living room couch staring at me. Their cage is kept upstairs. Luckily I stuck out my arm and she jumped right on. Elric was still in the cage on the wheel (probably just glad he did not have to share. Dobby was hanging out in my master bedroom and it took almost an hour to find Eilonwy hiding under a couch. Poor thing was terrified and jumped right into the pouch when I offered it. Xeno has given you some good information. Usually, gliders will go back to their safe place (cage). I have one that prefers to sleep near the cage but not in it... She also wants to sleep alone . It's important to have the room safe. Mine will stay on me when they hitch a ride. Especially when I head to the fridge for a mealie. I do wear a hoodie so they have a place to nap or sit in and watch. And they do jump off to explore. But will usually jump back. You can feel them take their "jump stance" usually. You can also prevent a jump by raising your open hand slowly to distract them. Mine don't like sudden movement at all. Nor do they care for sudden or loud noises.